A melanoidin style malt, it provides a strong, sweet malt flavor, and golden hue. Obvious choice for coloring and malty flavors for every type of beer. 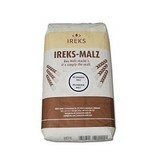 Allows the flavor of malts to come through especially especially biscuit hints. Also imparts bread aroma and taste. Similar to Munich malt but with more intense aroma. Usage: Pilsners, lagers, ales, light beers, special beers, all other beers.